Crop circles - The possibility of arising. Explanation, decipher, decode, discovery, break code, explaining, decryption, puzzle out, scientific research. Translation from text published in 9th November 2011 in www.sarden.cz (czech internet sci-fi magazine) into english. Not native speaker. Sorry for that, please. Note: All photos, because firstly published in Czech, contain a legend "Foto + No." Post is a free continuation of the reflection, concerning new ways of looking at the creation of crop circles, which was published at http://www.sarden.cz/uvaha-kruhy-v-obili. Become familiar readers with some other options of possibilities of explaining the phenomenon. The central motive of that reasoning was the fact that not only the crop circles, but also all irregularly lodged (damaged, weakened) crop in the world are caused by the same cause, lightning discharges into the fields. Thanks to their electricity was crop damaged, weakened and became flattened (damaged, weakened), but usually several weeks after discharge, which caused all that. Above the field in fact there was in progress a huge mechanical - electromagnetic explosion that was displayed in the structure of plants ("imprinted" or "exposed"), but flattening (damaging, weakening) appeared due to slow increasing of weakening the tissues after many days. Regular patterns are created only in very rare cases, due to accordance of many coincidences. But sometimes due to passed resonances and interferences, mechanical and electromagnetic, may be incredibly complex, also due to the fact that each explosion is mostly initially tending to spread in all directions very symmetrically. Motto: no Crop Circles, except for absolute exceptions, are made by people. What they are trying to present anywhere in the world group known as circlemakers - that crop circles are produced by them - is nothing more than figments of the mentally ill brains of authors of these statements. In fact, NOWHERE and NEVER and DID NOT MAKE any one man in the world even a single one crop circle (with the only minimum of exceptions, deep below the statistical error). Any so-called "Crop Circles" were made by someone completely different, who would do KILL>KILL any circlemaker during any potential meeting on that site immediately absolutely without mercy. Just at the beginning of today's paper will be thanks to interactivity of intenet format submitted an answer to a question, which was placed in the discussion under the first part: Ikkju asks, how is possible, that electricity generate such a complex and precise patterns. Meanwhile will be given the answer to "accurate" (circles) - by the demonstration, how the electric discharge(s) are able to create a very accurate circles, only by mechanical effect (photo 1), author's own experiment. 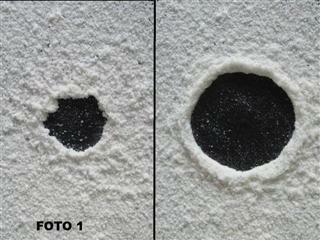 On the picture is a circle, created in a uniform layer of fine flour by electric spark, impacting vertically to the surface on which the layer is spread (a layer of granular material, the weight of particles tens to hundreds of millionths of a gram, the density around 720g/liter - approximately matches the plant material, thickness of just over a millimeter). On the left is displayed an effect of a single discharge (2500V-0,03J), on the right immediate consecutive repeating of the same discharge energy 10 times at a time distance of approximately 200msec (approximate average interval between thunderstorm lightning successive discharges is 50- 60msec). A smaller unit diameter is 11 mm, larger 18 mm. By repeating the size of the circle size extends only marginally (from around the fourth discharge up), but the edges are significantly refining, from the somewhat formless polygon to very precise circle. Since the number of spark discharges exceeds 6-8, the diameter of the formation is already not increasing at all, the effect of mechanical power does not reach farther to a larger distances. During a common lightning discharge there appear of about 7 successive discharges. 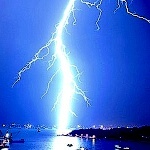 In some cases is lightning formed by only one major discharge (Return Stroke), but also those exist when after the first major discharge continues 12 or more subsequent strokes. The accompanying picture demonstrates very clearly, that for electric discharges, even as to their mechanical effects, is the creation of circles something completely natural and easy, and no one have to be surprised of it. Note: The intensity of average natural storm lightning discharge is more than 1015 times larger, than the intensity of spark discharge used in the experiment, i.e. billion times million more times. In case of figures is quite likely, that during creation of some of them can not only participate any ordinary lighting "baby", vice versa. What was during the "exposure" of some of them happening over the field, is absolutely no doubt among any ordinary human imagination. Everyone can certainly imagine the sound and mechanical effects caused by pistol or submachine gun. Even a very weak lightning transfers and radiates million times more energy (and moves with a hundred million times greater speed). In the previous article were described some basic principles of the newly described theory - the emergence of patterns in the grain by the action of lightning discharges. Also was indicated probability that they do not form only regular patterns - Crop Circles. Their origin is already many decades linked to so many curious and incomprehensible mysteries, that would be not possible to find in all of Red Dwarfs, Star Wars, Aliens, Predators, Terminators, Hitchhikers, Nosferatu, Transformers, Robots, Foundation, Das Kabinett des Doktor Caligari, Martians, Newts, Astronauts, Stalkers, Men in Black, Galaxy, Avatars, Frankenstein, Futurama, Star Treks, Matrix, Monkeys of any planet (including that one blue, where named Mankind), Monsters, E.T.s, Spider-Mans and Little Princes together, even if they had been helped in that by Short Circuit. It has been suggested that it is probably exactly the same origin principle of lodging (damaging, weakening) and damage almost of any crop in the world. Not only barley, wheat, oats and rye, but almost all field crops, any cultural plant growed in fields. Exactly by the same way arise very often flattened (damaged, weakened) irregular shapes (RDF - randomly downed formations) that are not only all the regular patterns almost inseparably accompanying, but more than 99.999% of cases (also square areas) occur quite independently. An exception to described rules are hurricanes, tornadoes and floods, but they are not included in the statistics - because these causes do not leave crop flattened (damaged, weakened), but completely damaged and destroyed, and they are not referred to as only "unfavorable hydrometeorological conditions", but as a real natural disaster. Farmers are already in such a cases almost not interested in that they have nothing to harvest, because they have no machines for harvesting, and no outbuildings, where to store the grain harvested. At first they must build new farm buildings and place into them new machines, and from that time they will take care of growing plants. As one of the substantial evidence supporting the theory, referring to it can be considered the fact, that cereals in all patterns, regular and irregular, exhibits exactly the same changes in growth - thickening, bent and extended nodes. Completely all of them are caused by negative geotropism and phototropism, never and nowhere by anything else, and it is sufficiently well-known fact to the scientists, professional and general agricultural public, but explorers of crop circles, however, are for years trying to inform constantly and patiently to the public something completely different. They argue that any "mysterious energy" first very quickly ( seconds to minutes) nodes bends or extends. Farther example, argues that a similar flexion or extension of nodes and tissues damage, which show plants in patterns can be achieved by means of microwave energy. Forgot already but, apparently purely " by chance" to explain, that plants or their components, which have been exposed to such a quantity of microwave (as well as thermal or electrical) energy, that their tissues become soft, they are so soft because they are cooked, so absolutely and completely dead, and after a few days (at the time of circles discovering) would not be there found on the field even a percentage of them. Dead are quite completely also plants that were exposed to even a slight percentage of energy, than what is needed to softening of the tissues (estimated below 1 %). It was therefore already a really high time to make stop to these their delusions. Immediate ( within minutes) flexion and extension of the nodes (but also any other parts of plants) by an effect of any energy or force is absolutely impossible without their complete destruction, and is possible to prove it repeatably at any number of attempts. Extension nodes arises in such cases where their strength is not enough to raise the plant - the first, second to third node from ground. (snímky) These nodes are trying by increasing the number of cells to raise the plant, but it fails, therefore the number of cells increases continuously and nodes are prolonging (simplified interpretation). Nodes will not get knowledge, that their activity does not lead to expected results, to cease its futile efforts. Such a way it is arranged in nature, and plants over millions years of evolution did not reach to the conclusion that it would be necessary to change anything on that. Bending are nodes, which at least in a part thrive, are at least able to move up a part of the plant. On the partial elevation of plants mostly contributes the most recent node below the top, a little less one or two below it. Some of them can bend almost by 90 degrees. Bending of the nodes happens by increasing (irreversible) of the cell number on the opposite side, not by changing the shape and the size of the cells, that is why became a thickening. Almost all of the "researchers", who has ever dealt with the issue of crop circles, from time to time on their websites spectacularly familiarize general public with photographs of nodes - bent, hypertrophied and extended, including what they call exploded nodes, blown nodes or expulsed cavities. On the photo 2 is just a tiny sample, all photographs from places where there was no sign of any Crop Circle (author's own photographs). Such bent nodes nature prepares annually worldwide in the fields, grassfield and grasslands as well as wildlife vegetation more than 10^15 (10^17?, 10^18? ), in crop circles occur much less than one millionth of a percent, but they look exactly the same. While the crop circles to meet in their life only a few people, in the same manner such as deformed nodes on this photo will find in the crop fields of absolutely everyone who will go there at the appropriate time (in our latitude of approximately April to August). 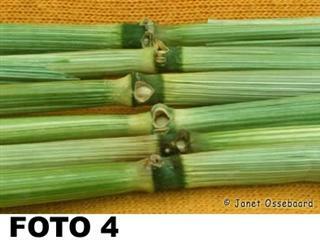 If he did not want go into the field, possible to grow them in a pot at home, and later (when nodes are sufficiently developed) change the direction of the stalks in the horizontal position to force the plants to create bent and extended nodes, quite indistinguishable from that found on the photos of the Crop Circles explorers. Also explosed nodes will appear there, all absolutely without acting of any "supplemental energies", for instance microvawe. Basically, Crop Circles explorers just show us absolutely nothing more then how it works in nature, and that it works the way it should, and what nodes are used for, nothing more. Nodes do not care for anything else than what they already perform millions of years, but no one had ever told that to Crop Circle explorers. One of their function is leveling the direction of plant growth into the the vertical direction, or tilting toward the light - negative geotropism and phototropism. This is done by an irreversible multiplication of cells on the side opposite to the desired direction of inclination, and begins several minutes after the plant records the deviation. This happens mostly even during the bending of the plants to the ground, which often may not to be a short process - minutes, hours, but may take several days. If the force effect of nodes thickening by the increasing in the number of cells is not enough to change the direction of growth to the required direction, cells are added continuously and the nodes are only prolonging. The extension of the nodes occurs even if that have to deal several times with a inclination of stem to a various direction. Crop Circle explorers do not report to the public nothing more, than that it works correctly in nature, but have just about the whole phenomenon rather wrong ideas. No mystery, no miracles, no signs, no unexplainable energetic processes. Nature. Nature is great guy. Almost like Eman. Inside young plants of the family Poaceae (smaller than 15 cm) developed without nodes may behave similarly any part of the plant, meristematic tissue (consists of actively dividing cells) is still everywhere, while in more developed plants only in nodes. Claiming that the bending or extension of nodes has occurred by the "action of unknown and inexplicable forces", or any forces at least a little known (microwave radiation), and even within a few seconds, maximum minutes, is in complete contradiction with reality. The idea that the nodes for the first bend and extend (in a very short time), and thanks to that plants are placed to the ground (within a very short period of time), without broken stems, and only then tries to straighten, is one of the greatest misconceptions, to which Crop Circle explorers reached, and it's only up to them how long they want to declare it. Bending and extension of nodes and tissue behavior during the vegetation period (including possible partial damage - can arise even by their own forces, or by dying off the damaged tissues), is botanically and physiologically very precisely documented and verifiable process. ALWAYS FIRST are the plants placed or at least substantially deflected to the ground surface (not vertical position), only then starts the process of increasing the number of cells in the nodes. Efforts of elevating plant parts will begin immediately after bending (actually, as mentioned, already during the lodging (damaging, weakening) process, which can take several days), and lasts approximately a week. By microwave radiation or any other physical force would never extend or prolong node in the plant even in the millimeter, not even bend over tens of degrees in a short time, without complete destruction (boiling, cutting or breaking). flattened (damaged, weakened) plants in patterns or anywhere else are not boiled. They are damaged, but alive. Immediately after the electric discharge have plants, in which there has become to a noticeable irreversible, so far mainly electrochemical changes, mechanical properties almost indistinguishable from undamaged plants, weakening of the tissues lasts for weeks. The vast majority of stems in the area of lodged (damaged, weakened) crop are not broken, but flexed just above the ground. In no case every of them. Something around 90 %, that is statistically very significant value, possible to prove by repeated exploration in the field anytime (not only in the regular patterns, but all the world's flattened (damaged, weakened) crop, which occupies an estimated area of many millions larger square). Plants damaged by electric current tries to get rid at least a part of harmful chemicals so that they are moving them down and eliminate by the roots into the soil, for the purpose of the least damage of ripening seeds. Thereby the lowest part of the plant is exposed to the longest and the most intense effect of these harmful chemicals, and during time (days, but rather weeks) it leads to a substantial weakening of the mechanical properties, so it is possible to bend the stem without breaking just above the ground. Mechanical reduction of the tensile strength (against breaking) and bending is easily measurable and verifiable, just a mere hand-test (comparing of lodged (damaged, weakened) and standing vegetation), better by more precise mechanical measurement. The deflection of healthy wheat stems in the mid-height by 10 cm perpendicular to the direction of growth produces change in weight around 10g - approximately 0,1N, plants in the immediate vicinity of lodged (damaged, weakened) vegetation about 10 times less, yet they are plants that still are not bent to the ground. To the deflection of the stems of healthy barley should be need approximately 3 times less force than that of wheat. The weakening of the plants is in this case possible, even if only very approximately, compare to a weakening caused by lack of humidity, is it possible to simulate by that. Lack of moisture however also operate much faster, and is completely reversible, except in cases where the plant was already quite irretrievably destroyed by drought. The entire described process may also be related to the principle of natural selection, because lodged (damaged, weakened) (damaged) plants have a significantly higher chance, that their seeds will contain damaged genetic information, offer themselves primarily "for consumation" to birds, rodents and other animals, also mildew and rot. 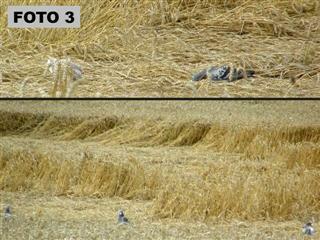 On the accompanying photograph are pigeons enjoying in lodged (damaged, weakened) wheat, while grains from standing crops are for them almost completely inaccessible (author's own photos). All, regularly and irregularly lodged (damaged, weakened) crop areas, contains a small percentage of broken stems, especially near the border of flattened (damaged, weakened) areas. This is because there occur in addition to weakened stems also much healthier, even completely undamaged, but can not resist to a few kilograms of heavy wet mass of weakened stems, falling to the ground due to the Domino Effect (explained elsewhere), what causes the break. 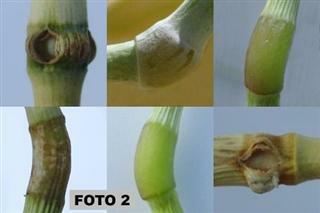 In any area of lodged (damaged, weakened) crop is possible observe "exploded nodes" or "expulsed cavities", see photo 4. They are not in the least caused by gas pressure, they were caused by considerable increasing in size and growth deformations in damaged and dying tissues, and may not be involved in them even any preceding damage at all, may be an entirely normal growth changes, occurring in plants due to entirely natural and gradual maturation of plant parts and tissues during ripening - drying (!!!!!). At first unobservable, microscopic dimensions, damaged areas are rapidly increasing by growing. Margins turn brown, for instance like the end of a torn leaf. Nodes of a healthy plant overcome the difference of few degrees against the vertical direction, at most to 20deg. Nodes of lodged (damaged, weakened) plants often bend back almost 90 degree angle, which for certain of them can lead to spontaneous mechanical damage, by their own strenght, without other serious damage. Tissues damaged by the electricity die and turn brown, but can be only part of nodes. Any other plant fraction may be only partly damaged. Some damage to the nodes therefore just happened to look as if created by the gas pressure, in fact, originally formed by increasing of microscopic, completely invisible changes in damaged tissues, (which may even die back only as a completely natural consequence of ripening) and it was in process several weeks. It is necessary to realize, that in the photographs are located plants, where elapsed between the damaging and image capturing several weeks. The damage was caused by electricity, but that effects are very similar to mechanical - dead cells, dying tissues. Immediately after damage by electricity plants are visually entirely indistinguishable from unaffected, although already in them may be found damaged tissues and significant percentage of completely dead cells (killed by products of electrolysis, heat, or due to the pressure of gas, originated by electrolysis). Only on plants, or their parts that have received much multiplied lethal dose of electricity (100x, 1000x and more) may be recognized immediate changes - twisted leaves, yellowing, browning or burnt blackened parts. Such affected plants are during a few days completely destroyed (dried to dust), not possible to find, while on the surviving individuals, the first visible effects appear after several days, rather weeks. Plants may be weakened as well (some of them only) by consequences of harmful substances resulting from the lightning discharge in the soil, but most often involves a combination of effects arising from substances in soil and plant body. There is flattened (damaged, weakened) poppy 2008 on the photo, also "the signature of the main culprit". The consequences of lightning discharge, not older than a few weeks, to a nearby linden tree, may be safely distinguished from any lightning strike older than year and more, according to the typical color of fresh damaged wood. To complement also included photographs of the same tree in following years. 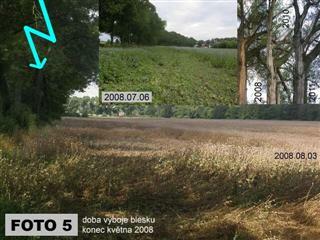 The flash symbol identifies affected tree, and in the upper right corner are photos of the same tree from the years 2008, 2010 and 2011. All the author 's own photographs.